Growing up in California, Binh Danh was fascinated by the weird discolorations left on the lawn by the sun. Shaped like a garden hose or a rake, the images were baked into the grass, the sun bleaching the bent blades. At the time, Mr. Danh could only marvel at the effects of photosynthesis — the process that sustains all plants — but by college he’d discovered that the sun’s power could also be used to replicate other images. Like the rake, Mr. Danh could leave his mark on nature. 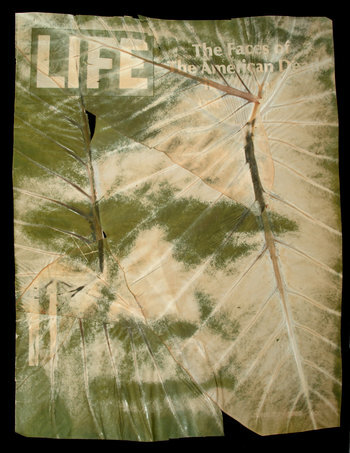 Mr. Danh invented the chlorophyll printing process, baking his images onto natural canvases with wild grasses and leaves. Mr. Danh is the child of war refugees displaced from Vietnam to San Jose in 1980. For more than a decade, Mr. Danh, now 34, has tried to recapture the experience of theVietnam War by printing images of suffering civilians, soldiers on patrol and the dead. American cinema provided Binh Danh with his earliest memories of his native country: the flickering images of the verdant jungles of “Apocalypse Now” and the grittiness of American soldiers fighting in “Platoon.” Though he couldn’t remember his time in Vietnam and his parents rarely spoke of the war, Vietnam and its battlefields remained a specter throughout his childhood. While Mr. Dahn’s parents believed it was important for him to visit the land of his birth, it wasn’t until his family was called to the bedside of an ailing relative in 1999 that Mr. Danh, then 22, made his first trip to Vietnam. Instead, he was viewed as an outsider — an American with a Vietnamese birth certificate. The theme of memory, and Mr. Danh’s relationship with his native country’s history, led him to the chlorophyll printing project. Part of the work’s novelty is that it forces the viewer to reconsider the very concept of a photograph. As a result, his pieces hint at the impermanence of ideas like identity, belonging, family, and history. To create the images, Mr. Danh prints a large format negative of a selected image on a transparency, similar to those used with overhead projectors. He then places the transparency atop a fresh leaf, sandwiching it all between a pane of glass and solid backing. Mr. Danh puts the entire unit in direct sunlight, usually on his roof. The baking process can take a few hours or a few days. During that time, light bleaches some sections of the leaf and alters the natural pigments in others. The process is little more than trial and error, Mr. Danh admits — only one in every five prints is successful. The prints that he selects are then dipped and preserved in two- or three-inch-thick blocks of resin. In Mr. Danh’s galleries these resin pieces are often hung on exhibit wall. “Visitors are prepared to see something different,” Mr. Danh said. “They want to hold on to that memory as a concrete object.” Resin, too, suggests the importance of history’s preservation. But the gallery was held only two months after the attacks on 9/11, and as American troops geared up for deployment to Afghanistan. Mr. Danh was concerned that his work would be misinterpreted as antiwar. Even today, he is quick to declare his images apolitical, admitting only that his work offers a different way to remember the costs of forgotten conflicts. As he continues to contribute work on Vietnam to photography and art shows around the world, he believes that each image stands as a meditation on trauma, death and remembrance of that time. “The idea of not using any chemicals to capture that image on a living thing was beautiful,” said Ashley Rice, 28, the director of photography for the Lisa Sette Gallery in Scottsdale, Ariz. In 2007, the gallery selected Mr. Danh’swork for display in a show, “The Botany of Tuol Sleng,” and has displayed his photography ever since. “Some people will look at the pieces from a process point of view,” Ms. Rice said. Other visitors, many of whom had lived through America’s Vietnam years, left the presentation with new questions about this period in history. Today, Mr. Danh identifies himself as a landscape photographer and remains as interested in the war-stripped jungles of southern Vietnam as he is the memories that continue to “nourish the land.” When asked about the complexity of his work, Mr. Danh looks to biology as a way of explaining how his images bridge the gap between science and art.